You've been searching for simple, powerful, and affordable hosted shopping cart software for your eCommerce web site that has the power to grow as you do. Look no further - you've found the CanadaCart.ca family of shopping cart and store builder products! 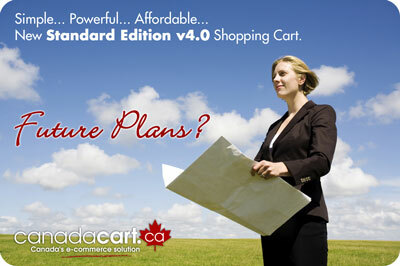 CanadaCart.ca :: Canada's e-commerce solution providers. Canadian ecommerce Shopping Carts and Hosted turn key eStores. © 1998 - 2016: The GDC Group. All Rights Reserved. Logos, Trademarks, and other identifiable and/or copyright marks are owned and registered by their legal owners. The use of any logo, trademark, or other such material does not constitute endorsement of any product or service.